Son of man, set your face against Gog, of the land of Magog, the prince of Rosh, Meshech, and Tubal, and prophesy against him, 3 and say, 'Thus says the Lord GOD: "Behold, I am against you, O Gog, the prince of Rosh, Meshech, and Tubal. 4 I will turn you around, put hooks into your jaws, and lead you out, with all your army, horses, and horsemen, all splendidly clothed, a great company with bucklers and shields, all of them handling swords. 5 Persia, Ethiopia, and Libya are with them, all of them with shield and helmet; 6 Gomer and all its troops; the house of Togarmah from the far north and all its troops--many people are with you. 24 He (the King of the North) shall enter peaceably, even into the richest places of the province; and he shall do what his fathers have not done, nor his forefathers: he shall disperse among them the plunder, spoil, and riches; and he shall devise his plans against the strongholds, but only for a time. 25 He (the King of the North) shall stir up his power and his courage against the King of the South with a great army. And the King of the South shall be stirred up to battle with a very great and mighty army; but he shall not stand, for they shall devise plans against him. So far Vladimir Putin has fulfilled Daniel 11:24. Putin has conquered all of Russia's oligarchs (rich corporate tycoons of Russia) and taken control of their corporations. He is now distributed to the people of Russia that wealth, along with all of Russia's windfalls from the skyrocketing oil and gas market (Russia is the worlds #2 oil producer just behind Saudi Arabia #1). Even now that the price of oil has been lowered he is using the fat he gained from the oil price hayday to rebuild his army and build the defences of his Islamic friends Iran and Syria. If I am right guess what is next!! Daniel 11:25 - Putin the Antichrist, along with his Muslim Islamic allies is going to take on the only nation on earth with a military that is better then his - the United States of America and its allies. Daniel says there will be three battles between the King of the North and the King of the South in the end times. In the first battle Russia and its allies will win crushing the armies of the United States and it's allies secretly using double crossing allies of the United States. Some of those that have benefited the most from the United States' generosity will betray her during this first battle and lead to the total destruction of the US fighting forces assembled at the battle. Eventually in the second battle the outcome will be different and the United States and its allies will win using their naval superiority. In the final third battle for world wide dominance, the King of the South (the United States) will attack the King of North. Putin will defeat the United States in a crushing blow and will drive out most of his enemies out the Middle East in a sweep of unstoppable force. Egypt, the United States' ally in the war, will be utterly defeated as well. In the Middle East, only the people of what is the modern day country of Jordan is mentioned in Daniel 11:41 as being able to escape him. 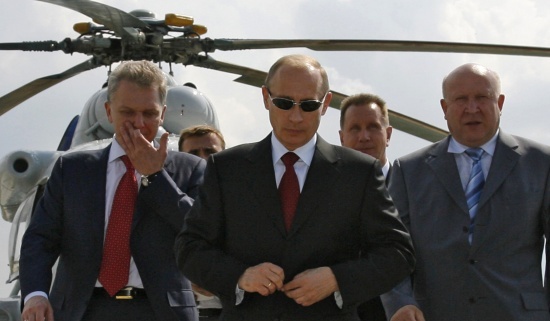 Putin will then go on to rule the Earth and hunt and kill many of our Lord Jesus Christ's true servants and wise men. According Daniel 11:37 - 39 The King of the North : "He will not respect the gods of his fathers – not even the god loved by women. He will not respect any god; he will elevate himself above them all. 38What he will honor is a god of fortresses – a god his fathers did not acknowledge he will honor with gold, silver, valuable stones, and treasured commodities. 39He will attack mighty fortresses, aided by a foreign deity. To those who recognize him he will grant considerable honor. He will place them in authority over many people, and he will parcel out land for a price." What this means is the Putin will use an Islamic army to accomplish much of his victories. So what does God want true Christians to do now and during the end times? 51 And suddenly, one of those who were with Jesus stretched out his hand and drew his sword, struck the servant of the high priest, and cut off his ear. 52 But Jesus said to him, "Put your sword in its place, for all who take the sword will perish by the sword. " 4 So they worshiped the dragon who gave authority to the beast; and they worshiped the beast, saying, "Who is like the beast? Who is able to make war with him?" 5 And he was given a mouth speaking great things and blasphemies, and he was given authority to continue for forty-two months. 6 Then he opened his mouth in blasphemy against God, to blaspheme His name, His tabernacle, and those who dwell in heaven. 7 It was granted to him to make war with the saints and to overcome them. And authority was given him over every tribe, tongue, and nation. 8 All who dwell on the earth will worship him, whose names have not been written in the Book of Life of the Lamb slain from the foundation of the world. 9 If anyone has an ear, let him hear. 10 He who leads into captivity shall go into captivity; he who kills with the sword must be killed with the sword. Here is the patience and the faith of the saints. 9 When He opened the fifth seal, I saw under the altar the souls of those who had been slain for the word of God and for the testimony which they held. 10 And they cried with a loud voice, saying, "How long, O Lord, holy and true, until You judge and avenge our blood on those who dwell on the earth?" 11 Then a white robe was given to each of them; and it was said to them that they should rest a little while longer, until both the number of their fellow servants and their brethren, who would be killed as they were, was completed. 3 Now as He sat on the Mount of Olives, the disciples came to Him privately, saying, "Tell us, when will these things be? And what will be the sign of Your coming, and of the end of the age?" 4 And Jesus answered and said to them: "Take heed that no one deceives you. 5 For many will come in My name, saying, 'I am the Christ,' and will deceive many. 6 And you will hear of wars and rumors of wars. See that you are not troubled; for all these things must come to pass, but the end is not yet. 7 For nation will rise against nation, and kingdom against kingdom. And there will be famines, pestilences, and earthquakes in various places. 8 All these are the beginning of sorrows. 9 Then they will deliver you up to tribulation and kill you, and you will be hated by all nations for My name's sake. 10 And then many will be offended, will betray one another, and will hate one another. 11 Then many false prophets will rise up and deceive many. 12 And because lawlessness will abound, the love of many will grow cold. 13 But he who endures to the end shall be saved. 14 And this gospel of the kingdom will be preached in all the world as a witness to all the nations, and then the end will come. Even in the end the end times God's order are simple - You must NOT use force to launch offensive attacks against the enemy. If you do you do for your own sake and your on your own. God doesn't need us or want us to fight his battles. In fact his orders are very clear. Endure and have patience. If you must die for the glory of God then do so. I am not opposed to using force to defend oneself or family but launching attacks against the enemy is not our job. Its God's. So if true Christians are not supposed to use the sword then how do you explain George W. Bush and his War on Terror? What does Jesus say about getting revenge for 9/11? 24 "Therefore whoever hears these sayings of Mine, and does them, I will liken him to a wise man who built his house on the rock: 25 and the rain descended, the floods came, and the winds blew and beat on that house; and it did not fall, for it was founded on the rock. 26 Now everyone who hears these sayings of Mine, and does not do them, will be like a foolish man who built his house on the sand: 27 and the rain descended, the floods came, and the winds blew and beat on that house; and it fell. And great was its fall." 5 Then the devil, taking Him (Jesus) up on a high mountain, showed Him all the kingdoms of the world in a moment of time. 6 And the devil said to Him, "All this authority I will give You, and their glory; for this has been delivered to me, and I give it to whomever I wish. George W. Bush is a rich man and a man who represents the will of fellow rich men. He believes in an eye for an eye mentality. Do really think he is doing the will of God? Until Jesus comes back to reclaim this world it is ruled by Satan. The United States of America is the most powerful nation on earth. Do really believe Satan would give his crown jewel of a nation over to a true Christian? All the rulers of this world serve one master and that is SATAN. 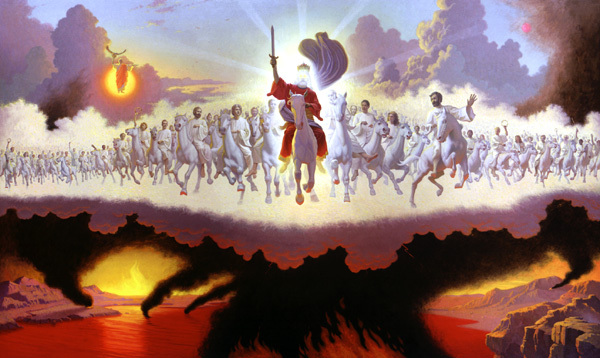 When Jesus comes back He will take His kingdom back from Satan, but until that time it is Satan's to rule over. Which do you think God hates more - the woman who has an abortion or the rich men that have conspired against the poor and the common people to make it financial suicide to have children? The woman will have one murder to account for, but the rich men will have millions of murders to account for. I believe George W. Bush and the militant so called Christian conservatives in the western world will be the excuse the antichrist uses to try to exterminate all Christians once and for all. All those who pick up swords or cause others to pick up swords in the "service" of God do the biggest disservice to Jesus Christ and the Holy Spirit and the spreading of his gospel. What Muslim would consider becoming a Christian if "Christians" murdered their loved ones? In fact all those who pick up their swords in the name of Jesus Christ have sinned against the Holy Spirit and will spend eternity in damnation. 33 "Either make the tree good and its fruit good, or else make the tree bad and its fruit bad; for a tree is known by its fruit. 34 Brood of vipers! How can you, being evil, speak good things? For out of the abundance of the heart the mouth speaks. 35 A good man out of the good treasure of his heart brings forth good things, and an evil man out of the evil treasure brings forth evil things. 36 But I say to you that for every idle word men may speak, they will give account of it in the day of judgment. 37 For by your words you will be justified, and by your words you will be condemned." Democracy is a sport for the children of the devil lying as their father lies. Men are unfit to rule over their fellow man. Only Jesus Christ is worthy to be followed unconditionally. I as a true Christian pledge unconditional allegiance to no man or nation on earth. My unconditional allegiance is to Jesus Christ alone and my citizenship is of the Kingdom of God. If you love your nation of residence more then God's Kingdom then you serve your master Satan lord of this earth for now! If you serve in the armed forces of any nation what will you do when you are given orders that are against the will of God? Will you say I don't want to kill these people, but what can I do I have orders? Who's job is it to fix this world and put under the rule of God and his Son Jesus Christ? 11 Now I saw heaven opened, and behold, a white horse. And He who sat on him was called Faithful and True, and in righteousness He judges and makes war. 12 His eyes were like a flame of fire, and on His head were many crowns. He had a name written that no one knew except Himself. 13 He was clothed with a robe dipped in blood, and His name is called The Word of God. 14 And the armies in heaven, clothed in fine linen, white and clean, followed Him on white horses. 15 Now out of His mouth goes a sharp sword, that with it He should strike the nations. And He Himself will rule them with a rod of iron. He Himself treads the winepress of the fierceness and wrath of Almighty God. 16 And He has on His robe and on His thigh a name written: KING OF KINGS AND LORD OF LORDS. Read Ezekiel Chapter 34 and in fact all the books of the old testament prophets. . In the end Jesus will reclaim His sheep from both inside Israel and without. He will take away the nation of Israel from the evil leaders who are its shepherds. He will give His kingdom over to the poor Jews of Israel and they will inherit it forever. The rich men of Israel will be thrown out of Israel forever for they are the goats that trample His true children. Indeed I will make those of the synagogue of Satan, who say they are Jews and are not, but lie--indeed I will make them come and worship before your feet, and to know that I have loved you.